My 15 year old daughter loved making these cookies with me and decorating them herself. We haven’t made sugar cookies for years since I wasn’t convinced that a healthy version would be good enough to be worth the effort. I was up for the challenge this year however and it ended up being well worth it! My daughter is looking forward to doing this project again next year along with full volume Christmas music. I believe in combining whole food flours to achieve the ultimate taste and texture needed for most healthy cookies. 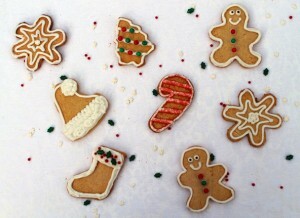 Especially sugar cookies! They are delicate as they need to be just the right texture to not fall apart or loose their shape when transferring to the cookie sheet. This recipe is a winner because they shape out perfectly and taste so good too! Happy Holidays! In a mixing bowl, add the softened butter and sugar of choice and mix together with beaters until well blended. Add the eggs and vanilla and blend together well. In a separate bowl, add the dry ingredients and mix together. Then add one cup of the dry ingredients at a time to the first mixture while beating with the beaters. Lay a piece of parchment paper on a clean counter and dust the paper with oat flour. Take some of the dough and place on the parchment paper. Flatten the dough and add more flour on top. Place another piece of parchment paper on top and use a rolling pin to roll dough out to ¼" thick. 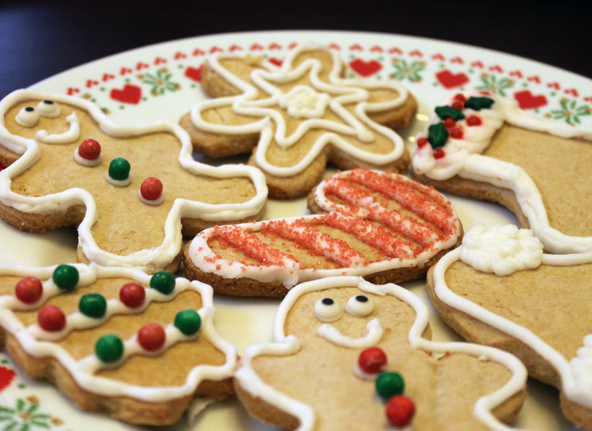 Use a spatula to transfer the cut-out cookies to baking sheets. Make a ball out of the remaining scraps and or add more dough and continue the process until the dough is all used. Bake them for 13 minutes in the oven for them to be a little soft and chewy or bake for 15 minutes to be slightly crispy. Just watch them closely as ovens can vary. They should be just lightly golden either way. Remove from the oven and place baking sheet on a cooling rack. Once they are completely cool, they are ready for frosting. Frosting recipe is still to come.